Before you crack open your next beer or sip your next glass of Chardonnay, consider red wine instead. Red wine will make you feel better than any other drink, not because it will get you tipsy (which it can! ), but because it’s loaded with resveratrol—a plant chemical with many known positive effects on heart health. Beyond its impact on the circulatory system, resveratrol may also be helpful for promoting immunity, and preventing obesity and Alzheimer’s disease. Imagine a blood vessel along the outer wall of the heart. Now, imagine a bump inside it: a plaque. And now, imagine a blood clot floating along inside that vessel. Thwack! It gets stuck because of the bump. Downstream, a chunk of heart muscle is deprived of oxygen-rich blood. That’s how heart attacks happen. Resveratrol’s cardiovascular benefits impact almost every part of the process of heart disease development (atherosclerosis)—those that contribute to the development of bumps (also known as plaques) and clots (thrombogenesis). Also part of the setup for heart attack: blood sugar and insulin imbalances, the level of constriction of blood vessels (blood pressure), and the ability of the body to repair damage to the walls of the blood vessels. Resveratrol reduces all the “bad” blood fats—triglycerides, LDL cholesterol, and total cholesterol—and raises the “good” form of cholesterol, HDL. One way heart disease gets started is through a process called macrophage activation. Macrophages are immune cells that create inflammation to destroy bacterial or viral invaders. Forming atherosclerotic plaques cause macrophage activation; this then contributes to chronic, low-grade inflammation that can make plaques grow and rupture. 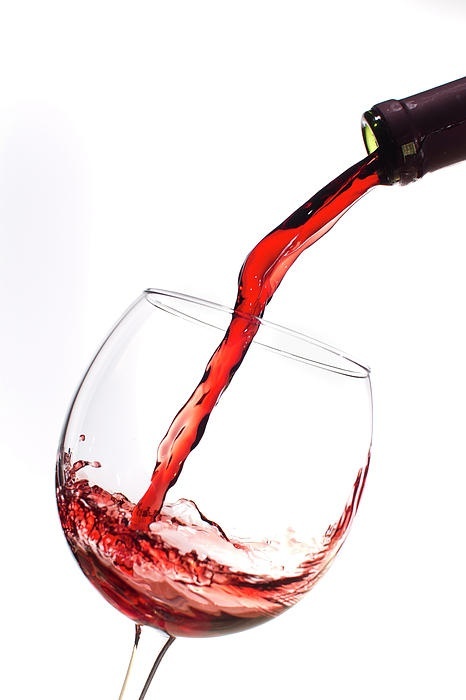 Red wine reduces macrophage activation. The plaques that lead to heart attack are initiated and encouraged by oxidized cholesterol, or cholesterol molecules that have been “attacked” by free radicals and transformed into free radicals themselves. Resveratrol reduces cholesterol oxidation. Atherosclerotic plaques fill with cholesterol; that’s part of what makes them grow and ultimately clog the arteries that feed the heart. Resveratrol reduces the influx of cholesterol into plaques and increases the release of cholesterol from those plaques. Plaques are stimulated to grow by certain body chemicals, including cytokines, homocysteine and angiotensin II. Resveratrol reduces their activity. Resveratrol works against multiple factors that contribute to the development of the clot, including such exotic things as platelet adhesion and PKC activity. High blood sugars and high insulin are two of the worst possible things for blood vessel walls. Blood sugar balance is aided by resveratrol. High blood pressure is a major heart disease risk factor, because it increases the chances of damage to the delicate walls of cardiac blood vessels. Those vessels have many twists and turns, and are in constant motion because the walls of the heart are in constant motion. Shear stress is already high in those vessels without the added burden of constricting blood vessel walls (that’s what high blood pressure is). Resveratrol reduces arterial remodeling, the process that changes the shape of artery walls in ways that heighten risk of heart attack. Resveratrol also enhances production of a chemical called nitric oxide (NO) by blood vessel walls. NO is a natural blood vessel dilator. If a heart attack does happen, pre-exposure to resveratrol appears to help reduce damage: it reduces the size of the heart attack and the death of cells, enhances cardiac output (the pumping strength of the heart), and coronary blood flow (the flow of oxygenated blood to the heart’s muscular walls). That’s a long list of benefits that resveratrol can have on cardiovascular health for both men and women. But that’s not all it can do! Brain benefits may include reduced beta-amyloid formation. Beta-amyloid is the compound that collects on neurons in the part of the brain responsible for long-term memory. Recent research shows that resveratrol might help reduce fat gain by impacting insulin receptors in a way that blocks the maturation of fat cells. Sipping red wine might even protect you against the common cold. One study of 4,000 adults found that they were 40 percent less likely to develop colds if they drank over 14 glasses of wine a week. That’s a lot of wine—more than I’d recommend for women, who see breast cancer risk rise by 1.5 times with two or more glasses a day—but still, a promising result. The take-home message here: one glass of red wine a day for women, one or two for men. Relax and enjoy not only the taste, but the health-related benefits as well! Dr.Kraszynska has helped thousands of patients transform their lives by achieving their desired health goals. She is a leading expert in the fields of alternative medicine, bio-identical hormone replacement and anti-aging medicine. She constantly researches the most sophisticated medical databases and is always prepared to implement the latest scientific breakthroughs for the benefit of her patients.